An upright PASELI charge station. PASELI (Pay Smart Enjoy Life) is a digital currency service created by KONAMI in 2010 for its arcade games. A PASELI account holds points, where one point (1P) is equivalent to one yen, and can be used for paying for credits or can be used for micropayments on games supporting PASELI. Certain arcades sell 1000P PASELI prepaid cards which can be used to add points to your balance without requiring a credit card or BitCash. 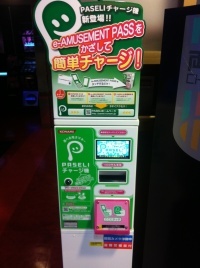 As of March 27th, 2012, certain arcades have PASELI charge machines where you can load ¥1000 to your PASELI balance by merely waving your e-amusement pass and inserting a 1000 yen note (¥1000). As of April 2014, KONAMI has raised the standard price of a credit for Japan-region machines from 100P to 120P. Coin mode is still available to play on these machines; however, in most games player will be locked out of a number of features in exchange for playing at a cheaper price. On March 17th, 2016, pop'n music éclale, BeatStream アニムトライヴ, and GITADORA Tri-Boost received an option to pay a smaller amount of PASELI to play with the restrictions of coin mode. This was added for DanceEvolution ARCADE, beatmania IIDX 23 copula, SOUND VOLTEX III GRAVITY WARS, and REFLEC BEAT VOLZZA 2 a week later, and for DanceDanceRevolution A upon release. On July 1st, 2016, the unit for PASELI points has been changed from "P" to "円" (yen). Its monetary value remains the same. PASELI can also be used in beatmania IIDX INFINITAS and SOUND VOLTEX III GRAVITY WARS コナステ in order to purchase a monthly subscription and tickets. PASELI launched on March 31th, 2010 with QUIZ MAGIC ACADEMY 7 and MAH-JONG FIGHT CLUB GARYO TENSEI (麻雀格闘倶楽部 我龍転生), being the only two games supporting it at that time. DanceDanceRevolution X2 was the first BEMANI title to support PASELI. All the other BEMANI titles released since then, now include PASELI support. Prior to PASELI, KONAMI used KONAMI COIN (コナミコイン) in April of 2008. It was only usable for character customization in QUIZ MAGIC ACADEMY 5 using eAMUSEMENT. It was later renamed PASELI in September of 2009 during the location test of QUIZ MAGIC ACADEMY 7. To register for a KONAMI ID, follow this link. Note: if you intend to use PASELI in Japan, you need to register your region as Japan. Otherwise, you won't be able to use PASELI. An e-amusement pass. It has to be linked with a KONAMI ID. To link an e-amusement pass with a KONAMI ID, the e-amusement pass card number (カードナンバー) and PIN (暗証番号) have to added to the e-amusement pass members' website. Be sure to check the checkbox in the PASELI利用設定 (PASELI Usage Settings) section to enable PASELI. A PASELI prepaid card, supported credit card (Visa, MasterCard, JCB), or BitCash electronic money to add to your balance, or physical access to a PASELI charge machine. Click the green 利用を開始する button to enable PASELI on the PASELI settings page. Note: Adding to your PASELI balance via the Web requires a Japanese KONAMI ID, as the charge process takes you to My KONAMI, which is localized and doesn't display PASELI-related options when your region is anything other than Japan. This does not prevent you from using PASELI charge machines, which are more convenient, but are still a bit hard to come across. You can add to your PASELI balance by pressing the PASELIをチャージする button on your PASELI settings page. You are limited in the amount of points you can add to your balance at a time (¥500, ¥1000, ¥2000, ¥3000, ¥5000, or ¥10000). This page was last edited on 10 March 2019, at 22:54.